If you’re British and have a few vacation days to fly across the pond, then there are a few places that should be on your must-see list – and we’re not talking about the Statue of Liberty, Empire State Building and Ellis Island, as nice as they are. All Brits are fans of The Beatles (so are we if truth be told) so take the subway and head for 72nd Street to begin your tour. As you exit the subway, you’ll be able to spot fellow Brits – they’ll be wearing their Beatles or John Lennon T-shirts. Your countrymen will be heading for the Dakota, where John Lennon was shot and where Yoko Ono Lennon still lives over 30 years after her husband was murdered. The helpful doorman will nod his head as you look around wondering where it all took place, but don't bother to look up – no one will open the window. You’ll be better off crossing the road to the entrance of Strawberry Fields and taking your picture from there. Stepping a few yards into the 2.5 acre garden, a gift from New York City in memory of its adopted son, you’ll feel the tears well up as you realize this is the one place in the world you can really bond with John Lennon and it’s nowhere near Liverpool. The mood is very serious in this zone. People have traveled here to pay their respects, although you’ll have to queue up to have your photograph taken by the Imagine mosaic, a gift from Italy when the park opened in 1985. At that time New York City gave the gift of these 2.5 acres in memory of its adopted son. Another must-see is the bronze plaque that lists the 121 countries that support the quiet zone as a Garden of Peace. 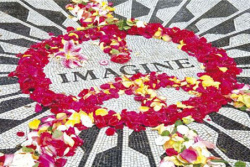 On leaving Strawberry Fields you have two choices; stay in Central Park to see the rest of it (841 acres!) 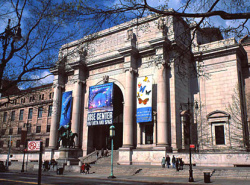 or walk over the road and enter the American Museum of Natural History. The Park is the better option unless you have planned ahead, as you can't see the whole museum in a day. There's great joy in walking in a quiet park, surrounded by 9 million New Yorkers, but missing the hustle and bustle of almost all of them. You’ll feel like you could be on a small island, with 150 acres of lakes, 130 acres of woodland, 24,000 trees and 250 acres of lawn. You’ll find plenty of places to stop for a coffee or water, and food of all choices. You can sit on one of the park’s 9,000 benches or play with your children in any of 21 playgrounds. And there are 36 bridges to cross and 55 sculptures to see. It's a great day out. Having rested, you’ll need your walking feet ready for the incredible American Museum of Natural History. Be ready to enter at 10am and plan to stay at least until closing at 5:45pm. You may have seen dinosaur bones on television, but here you’ll see hundreds of real life exhibits so you can take in their size and power. Download the map before you arrive so you can plan your day, choosing the exhibits you must see and then those you’d like to see if you have time. Almost 150 years old, the museum has a series of revolving exhibits so there will always be something new to see on your next visit. Whether on the streets of New York or in ski hotels Finland most English travelers won’t allow their vacation plans to get in the way of watching their favorite football (we call it soccer) teams on television, even with the 4 or 5 hour time difference. To make sure you don't miss the action, find an Irish bar as they usually show as many soccer matches as possible. If your choice is Manchester United or Chelsea, then your game will almost certainly be on. Still have spare time? Then check out the many other famous attractions New York City has to offer – and don't forget to leave a minute to visit the stalls in Times Square and trade your UK union flag T-shirt for an 'I love New York' one! This entry was posted on Thursday, October 27th, 2011 at 12:43 pm	and is filed under Stuff to Do. You can follow any responses to this entry through the RSS 2.0 feed. You can leave a response, or trackback from your own site.